Visions of synchronized propeller headbanging instantly come to mind as the play button is pressed and from the hammering storm of technical aggression rides California’s Embryonic Devourment on their amplified battle stallions of death. It is hard to discredit a band showcasing such obvious talent, but let’s face it, tech brutal death metal is a tired animal. Having said that, I still like this genre and lately specifically, have been listening to it often, but what sets the good bands apart from the the rest (and it is acceptable to clump the mediocre together with the bad here because in the end, it’s all the same), is the songwriting. Good songs and a screamer that builds upon the riffs he’s empowering with independent vocal lines are paramount. I really need those riffs to create something not only human flayingly aggressive, but musically tangible. IE, there’s got to be noteworthy hooks, or something to process other than a barrage of meaningless notes. 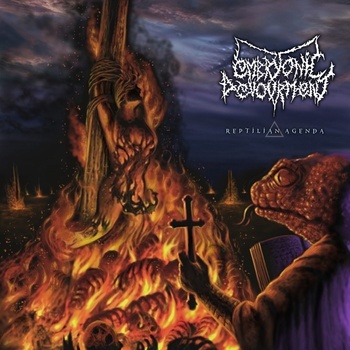 Unfortunately for Embryonic Devourment, they tread into all of my brutal death no-no’s, but do so with technical proficiency for their instruments. ~ by martyworm on January 29, 2014. This entry was posted on January 29, 2014 at 8:45 pm and is filed under ALL REVIEWS, E-reviews.You can follow any responses to this entry through the RSS 2.0 feed.You can leave a response, or trackback from your own site.